Micoe is a woman with a slim figure. Her look is brown and mischievous, and her brown hair is tied in a long braid that extends to the middle of her back. 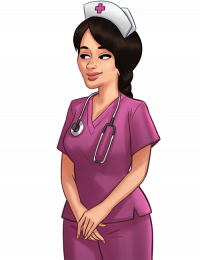 A pink medical gown and a nursing cap are part of her nurse's uniform. She usually wears a stethoscope around her neck. Micoe is curious, maybe a little too much, but her helpfulness cannot be faulted. Micoe is working as nurse at the clinic. She is present during the main character's medical examinations, to which she makes her own contribution. In the clinic's bathroom, the main character must overcome his stage fright. There are several ways to do this, but the nurse knows the best technique. This page was last edited on 18 April 2019, at 15:45.